Dealing with feelings is complex and demanding, especially for those of us who are naturally much more at home dealing with rational thinking. Yet, even for the most dyed-in-the-wool “thinking type”, there will come times when we absolutely must deal with our feelings, if we are to make any kind of meaningful sense of our lives. Here’s a point that C.G. Jung was always making: there can be no dispute that, if a person is in the grips of a feeling, that’s a real thing. The feeling may not be a reality in the external word, like a sushi roll or a subway train, but make no mistake — it’s real and really effects the person that has it, and possibly other people as well. As noted Chicago psychotherapist Joyce Marter suggests, in modern culture, we’re socialized to cover up our feelings. We frequently get the message that we have to cover up our feelings in order to behave “appropriately” in social environments, or to act professionally, or, we are told, to avoid conflict and to make relationships work properly for us. Certainly, it’s true that we often have to control our feeling in social settings. But does that mean that we’re not supposed to feel them? From a depth psychotherapy perspective, that seems not only wrong, but psychologically impossible. Feelings exist not to give us trouble, but to serve incredibly vital psychological functions. We need to listen to our feelings, to understand them. If we do not, our unacknowledged feelings are going to trip us up at every turn. This becomes particularly true at times like major life transitions. Our feeling states can very often lead our more rational mind to a better understanding of situations that we are in, and their true impact upon us. We need the feeling parts of ourselves! If we want to stay connected to inner and outer reality, we really have no alternative but to pay attention to our feeling states. Sometimes, it can be very hard to easily identify what we’re feeling. 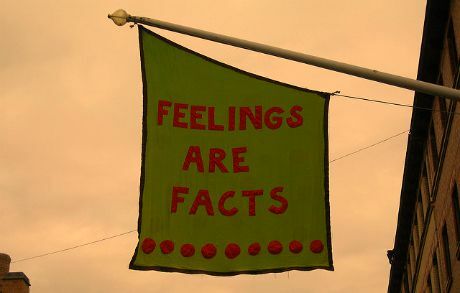 You don’t have to act on your feelings, or even verbalize them to others. But it can be extremely valuable to acknowledge them, and to know what they are. There are a range of ways we can begin to get closer to our feelings. Journaling or therapeutic letters. Sometimes it can be very useful to write about what we are going through emotionally, or even just our ordinary daily lives. This can take the form of a journal entry, or of a letter written to someone who has evoked strong feelings in us, (which we may or may NOT decide to send to them.) Sometimes showing such writings to a trusted therapist can be of a great deal of help in processing feelings. Identifying emotions. Sometimes we recognize that we don’t even have the right vocabulary to really identify what it is that we’re feeling. There are tools, such as feeling charts that we can use. Here’s a simple one — but still very useful. 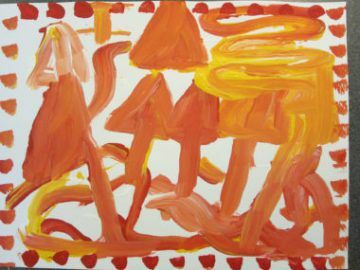 Using art to identify feelings (and intuitions!). Painting, clay, drawing, making music … these are all natural forms of human expression, and they can all help greatly in getting us down and in touch with our feelings. Depth psychotherapy can be extremely helpful in processing emotions, often in conjunction with one of the above approaches. For all of us, but particularly for thinking oriented people, the journey towards wholeness is going to take us through the territory of processing our feelings. It might be good territory to go through with the help of a trusted therapist.